SET on level 2 of PoMo (formerly known as Paradiz Centre) very much mirrors the concept of Tao's Restaurant which used to be located at the basement of the same building. Not too surprising, as it's very much the same peeps behind both establishments. The winning formula that warrant a repeat? Contemporary cuisine that is attractively priced. 5-course lunch is at $28.80++ and 6-course dinner is at $38.80++ only. Best, there's no exorbitant price hike during occasions like Christmas, New Year or Valentine Day. Yay! Even though the menu is prix fixe, it is not totally restrictive but instead allows us diners a good degree of flexibility to choose what we like for each course from a choice of 4 to 5 dishes. Oops, a little correction here: There is no other choice for the Chef Starter of warm Bacon & Cheese Gratin with Toasted Bread and Side Dish (for 6-course dinner only) of juicy Grilled King Oyster Mushroom with truffle cream. But both were well-executed in terms of taste and texture, I'm more than satisfied with their deliciousness that I wouldn't trade it for other items. While Cold Dish such as Smoked Duck Breast and Salmon Gravlax leans on the safe side, SET's executive chef Erick Chun does throw up surprises like the Huai Shan Carpaccio. Thinly sliced with a refreshing crunch and just a dash of minimal seasoning to enhance its natural flavours, it was certainly a creative way of enjoying this root vegetable. The Tomato Caprese differs from the norm with a topping of cream cheese mousse instead of the usual Mozzarella cheese, but nonetheless likeable. Soup selection range from Asian-style light and clear Miso Soup with Sake (gimmickly served in sake bottle) and Double-boiled Herbal Chicken, to the heavier cream-based Roasted Pumpkin with Truffle and Mushroom Velouté with Peanut Butter. I tried all the soups that evening, but if I had to choose only one, it would be the mushroom velouté just for novelty alone. Peanut butter in mushroom soup? Win already! The peculiar pairing of earthiness and nuttiness worked out uniquely well. Choices for Main Course include the Marinated Rack of Lamb, Baby Pork Back Ribs, as well as Roasted Beef Tenderloin. We didn't like Grilled Snapper with Salsa which was a tad fishy and overcooked that evening. My favourite went to the Roasted Chicken Pullet stuffed with mushrooms and chestnuts. Cooked to adequate tenderness, it was one of the rare times when I enjoyed chicken breast meat. The chestnut sauce provided some needed moisture to the each mouthfeel. Not fantastic in gastronomic sense, but overall the most enjoyable among the mains. Desserts are always one thing to look forward to at any meal, but sad to say, it is the weakest link at SET. The variety is good with Homemade Cake of the Day, Espresso Crème Brulée, Pistachio Panna Cotta, Poached Pear with Gelato and Huai San Jello, but none of what I've tried was impressive enough to be memorable. 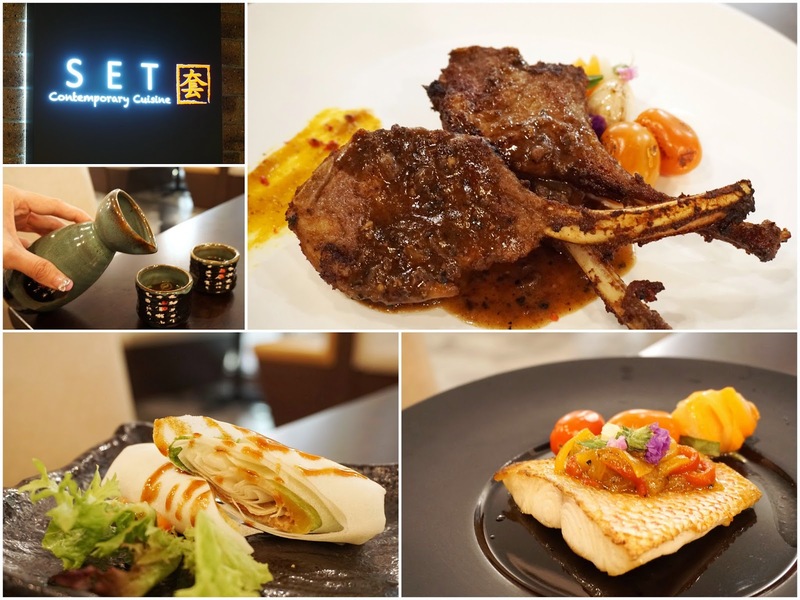 Besides the wallet-friendly pricing and decent food, another thing which I like about SET is their spacious space with a main dining hall, private rooms and even an alfresco area overlooking the shophouses along Prinsep Street. A very suitable place for gatherings with family and friends.